There was an old man working in a field. It was a hot day and the work he was doing was difficult. 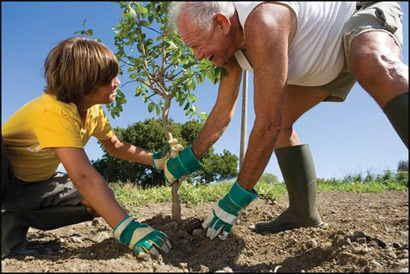 A group of young people passed by where the old man was working and noticed he was planting fruit trees. They laughed and thought the man was foolish. The old man understood why they were making fun of him and they were correct. He was indeed old and the trees he was planting wouldn't begin producing fruit until long after he was dead and forgotten. The old man patiently explained that the fruit that would one day grow from the trees wasn't for him. "Then for who?" the young people asked. "The orchard I am planting and the fruit that will grow one day" he said, "is for you." The story of the old man captures the spirit of who we are as an organization and our plan to grow a new generation of innovators and a bumper crop of new innovations. "Until we're educating every kid in a fantastic way, until every inner city is cleaned up, there is no shortage of things to do."